It’s a well-known if rarely utilised fact that you’ll always see more walking somewhere than by driving – or even pedaling. So it is that I park and check out Buckley Street on foot for the first time in at least a decade. 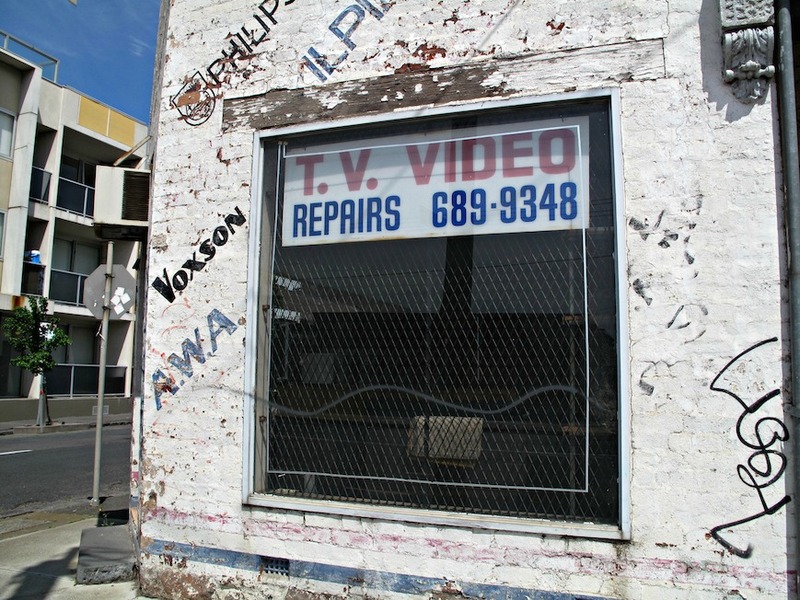 Buckley between Nicholson and Victoria has remaining vestiges of earlier times, decades and uses. 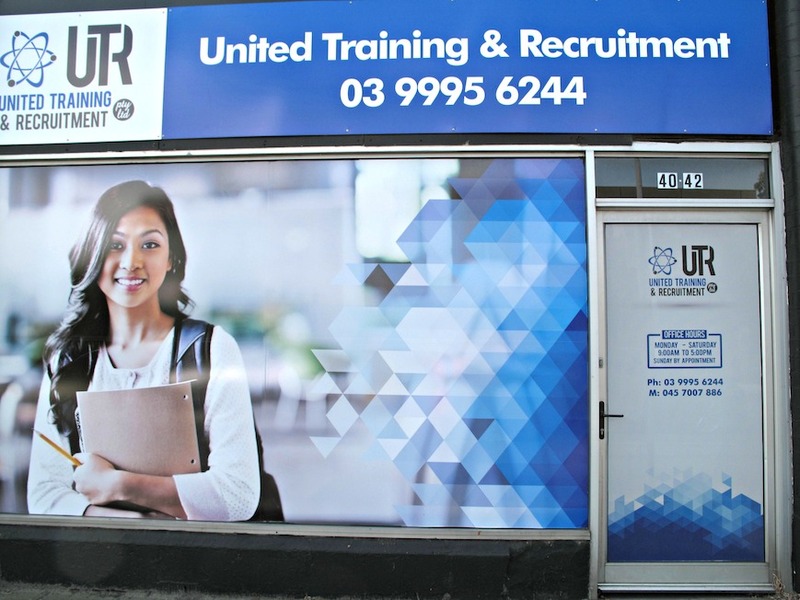 But there’s a reason why it’s such an inhospitable stretch of street, and why there is little or no street life, and why the very little retail or business activity is heavily weighted towards tradies and the like. That reason is traffic – lots and lots of traffic. The reason, in turn, for that is that this stretch of Buckley is a gateway, in one direction, to Sunshine, Geelong and Williamstown. And in the other direction, it’s a gateway to Footscray Road and, less directly, Dynon Road. All that traffic, and all those people in hurry, makes the intersection of Buckley and Victoria (above) one of the most accident-prone we know of. Barely a week passes that we don’t see the aftermath of prangs, mostly caused we presume by cars and trucks barreling towards Melbourne having unpleasant interaction with those heading in the other direction and turning right into Victoria to go under the railway line. But let’s go for a wander, hey? Down one side of Buckley and up the other? On the Seddon corner at Victoria, what was for a long time a Vietnamese pool hall is undergoing refurbishment that will see it reopened as a “convenience store”. The application posted in the window doesn’t generate much optimism that this will be good stuff for Consider The Sauce and its readers! A little further along, what seems like it was almost certainly a service station many decades ago is now home to West Suburban Taxis. 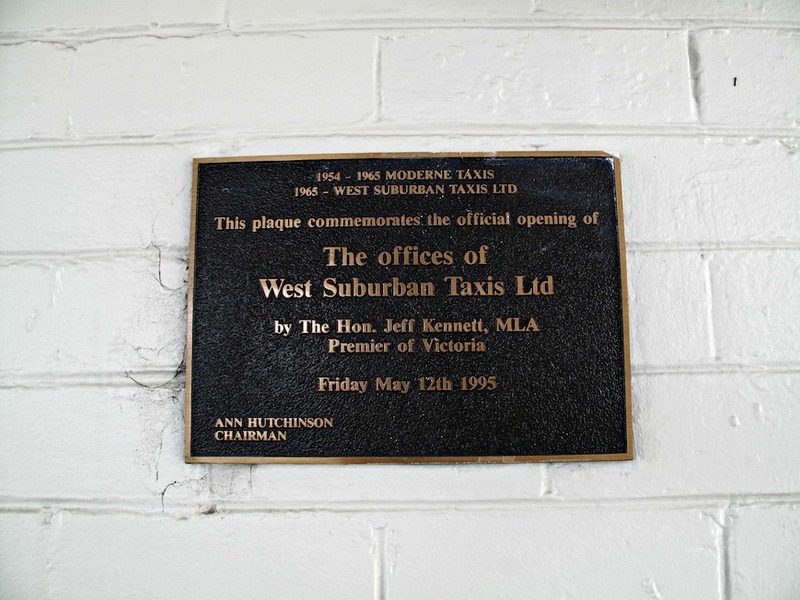 It was unveiled as such by the then premier in 1995. Heck, there must have been an election in the wind! 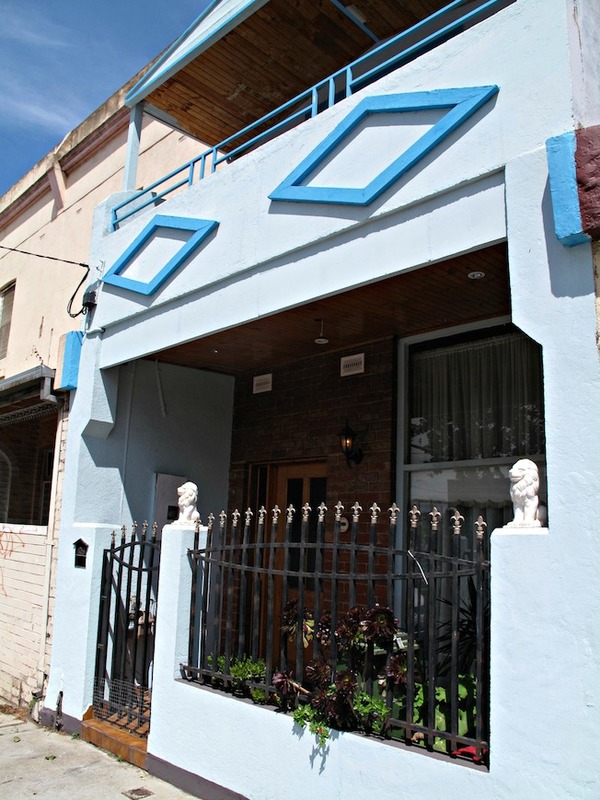 Then comes a block or so of double-storey terrace houses, some done out nicely, some looking rather tatty. 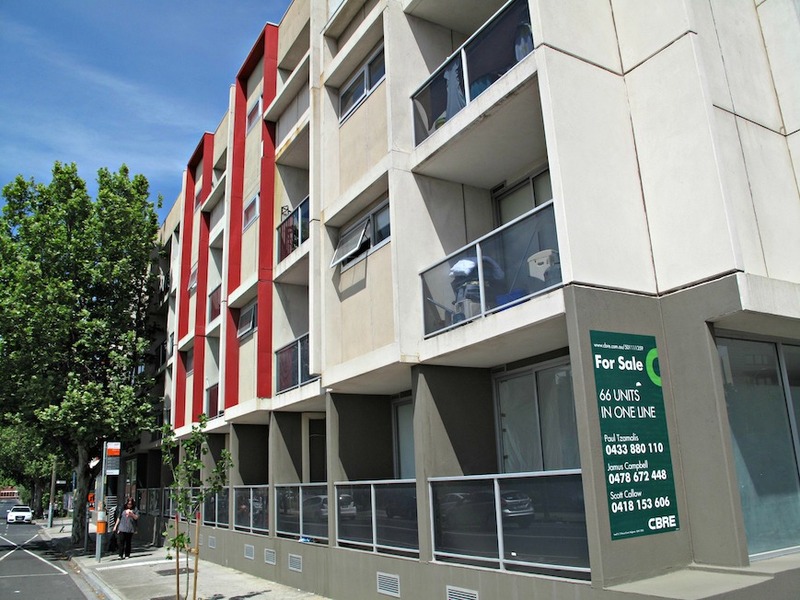 Moving a bit further towards the CBD and we come across one of the very few newer structures on the street – a block of apartments. 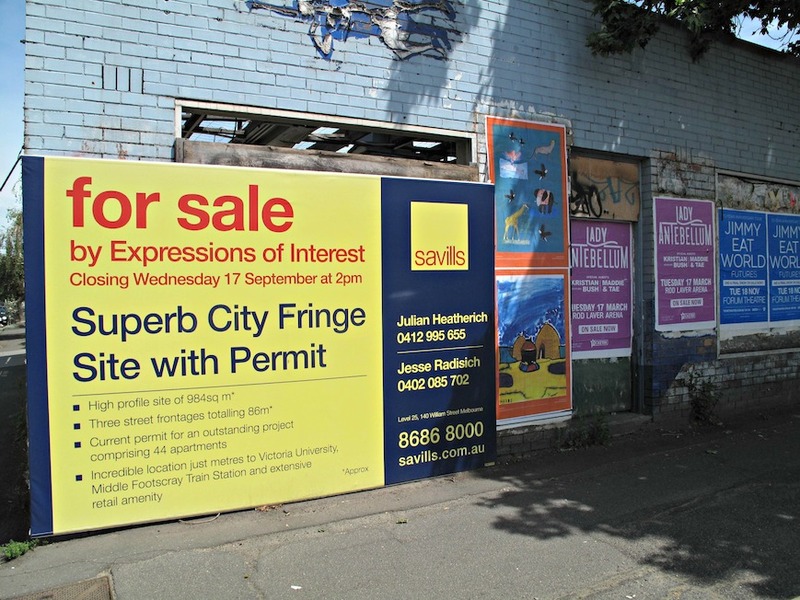 The empty, large block right next door could become home of even more apartments – if a buyer is ever found. From there, and before we cross Buckley and head back the other way, there’s a bus depot … and then the university. The Belgravia Hotel is no more. And nor is its colourful array of, um, “entertainment”. This too is destined to be a site for apartments – and going by the sign, those plans do not include use of the existing structures. 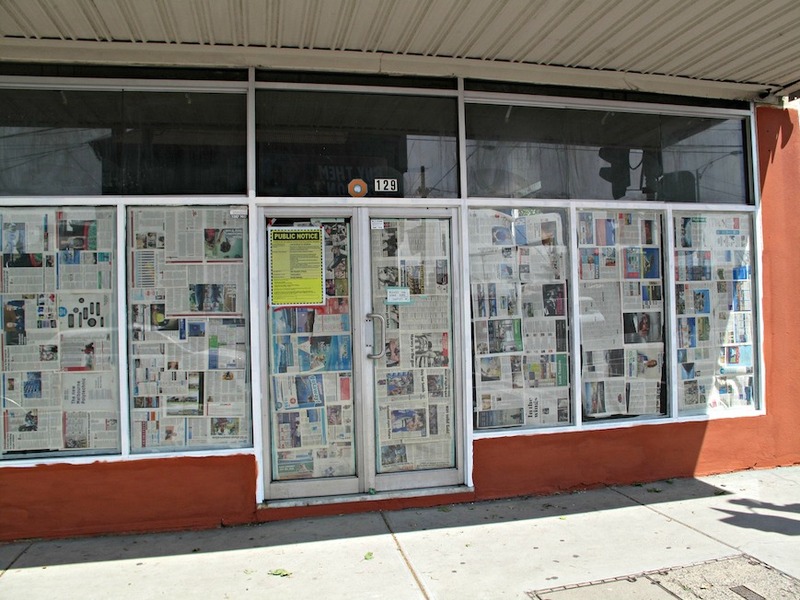 Next door, what was once the home of the Hot Shot pool hall and coffee emporium is uninhabited. We never made it in for a game or a taste. 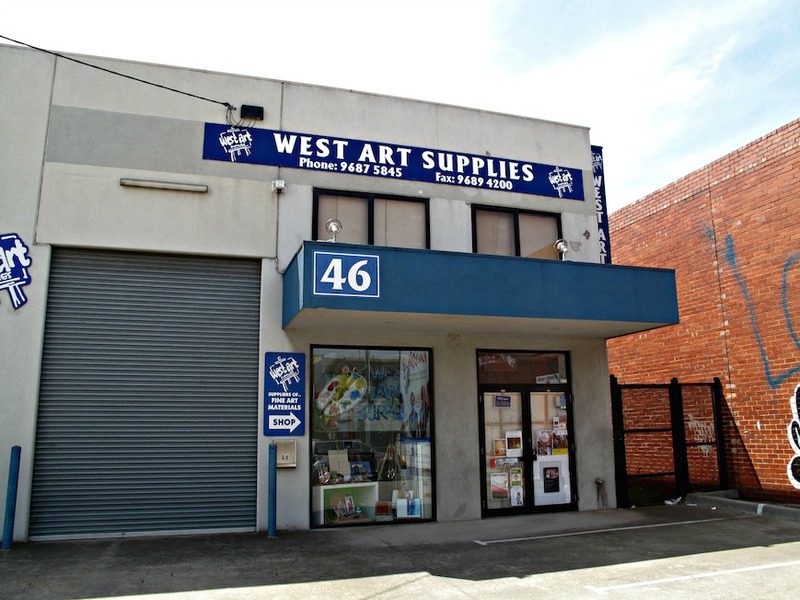 … while the arts supplies outfit itself has moved a few doors away to a more utilitarian property. Now we’re moving into spaces and places with which Bennie and I definitely have a shared history. I once bought him a paint set at West Art Supplies. And we spent a lot of time at the swimming pool. It was nothing like the gleaming edifices to be found at Kensignton or Highpoint – rough concrete floors were all the go. Rough, clammy concrete floors … but the place had a water slide and we liked it. I presumed this property, too, had fallen into disuse – but I spot a pair of slippers through the frosted windows so walk around the side. 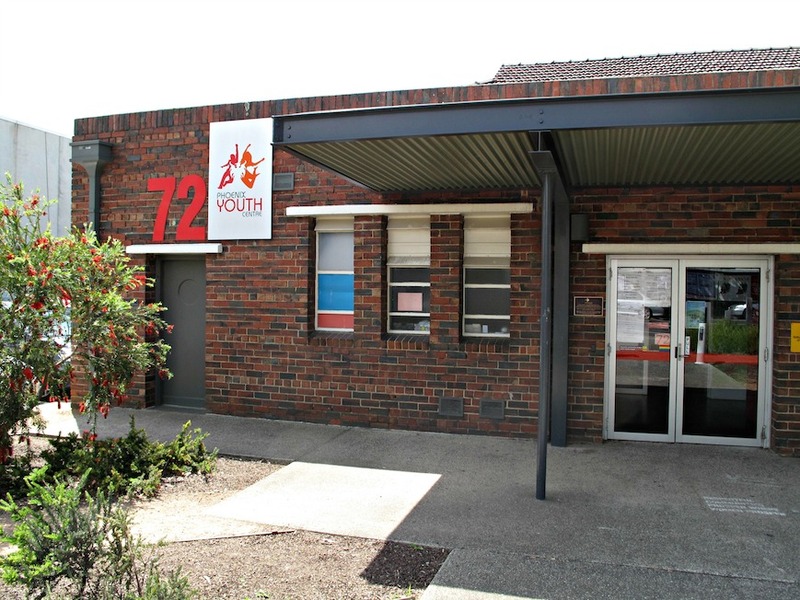 The whole place, including ancillary buildings, is now a Salvos aged-care establishment. The brick building next door, once home to child-care activities, is these days used by a handful of community service groups. 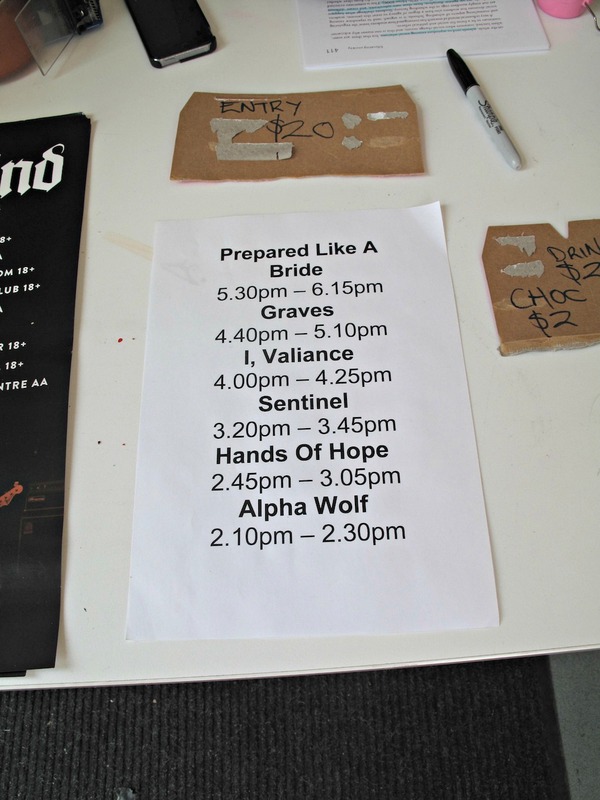 And one of the rooms is, on the afternoon of my ambulatory inspection, being used for a grungy metal gig! What was once a florist/garden/homewares business morphed at some stage, and briefly, into all of the above plus coffee and rudimentary eats. And now it’s nothing at all. 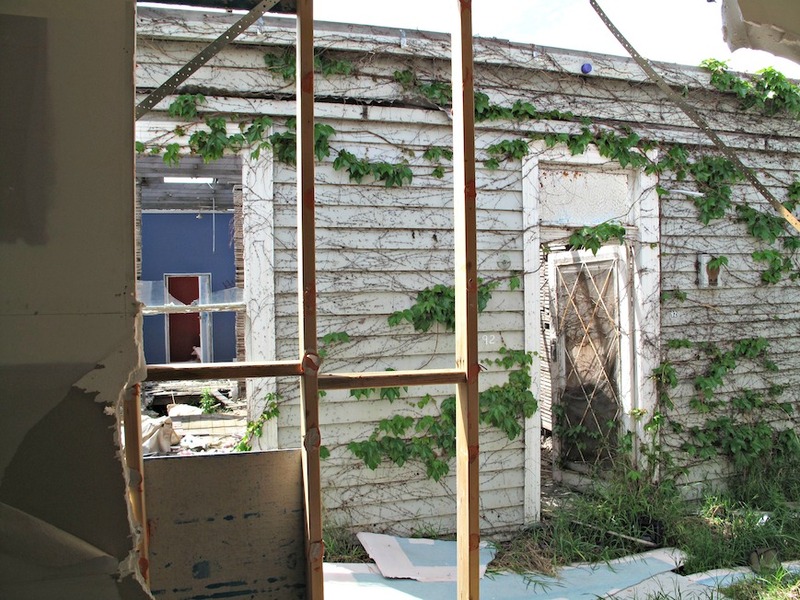 Next in line is another surprise – what was once a display home, now fallen into ruins and dereliction, has another, older house – also a complete wreck – behind it. 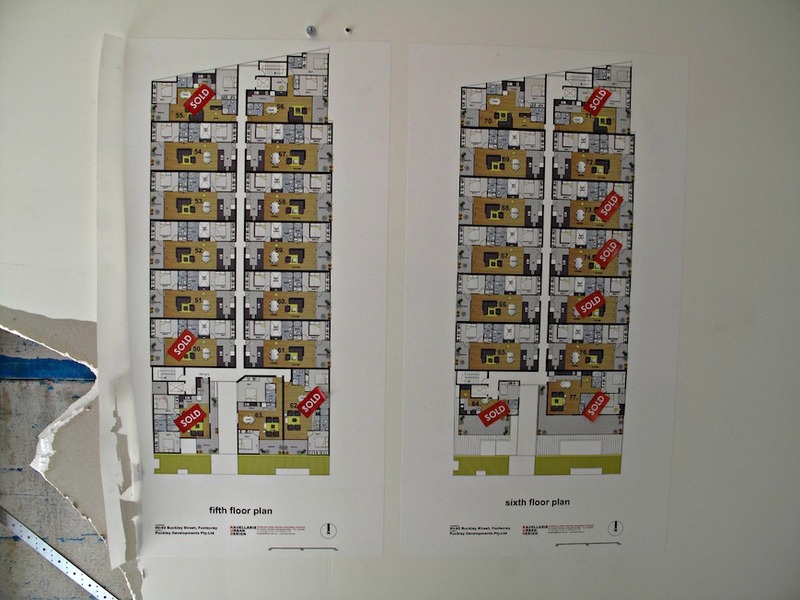 The once-was-a-display-home still has floor plans with “sold” stickers on them! 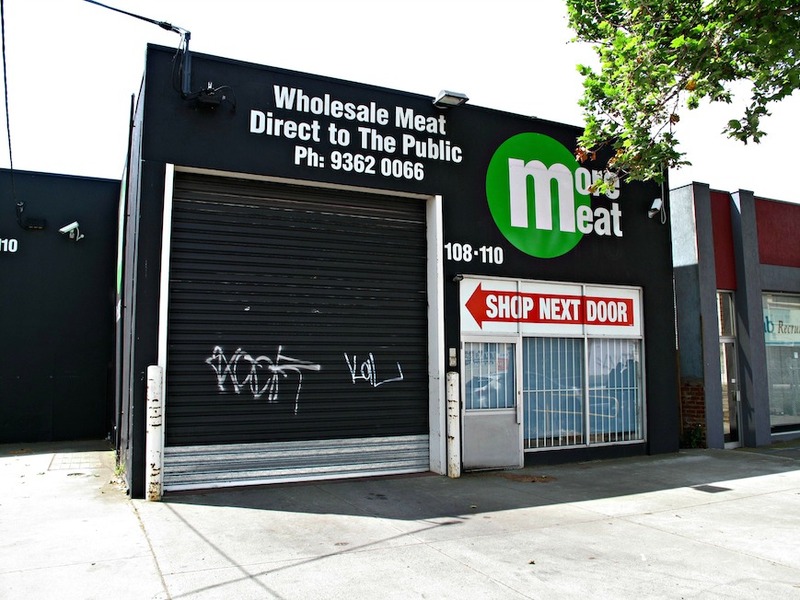 The cheap meat place is these days called More Meat. We once shopped there quite regularly, and I know people who still do so. 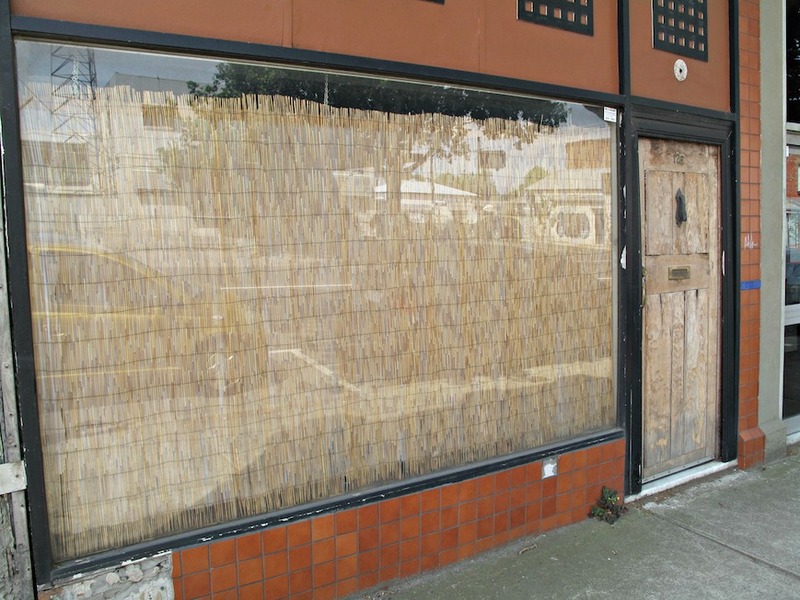 … another shopfront with, rather mysteriously, no signage and matting in the entire window space. Finally, right on the corner of Buckley and Victoria is the purveyor of all things canvas that seems to have been right there forever. 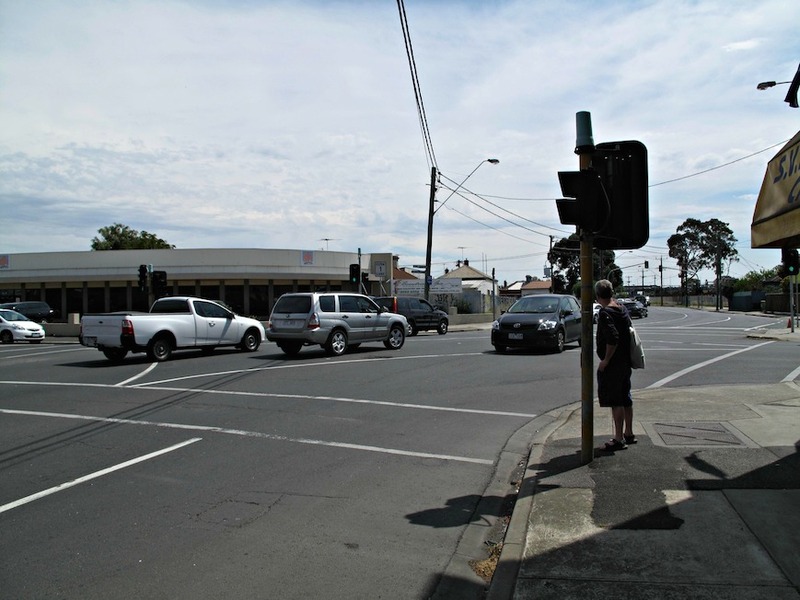 So is this stretch of Buckley … Footscray? Seddon? Both? According to Google maps, it is both. 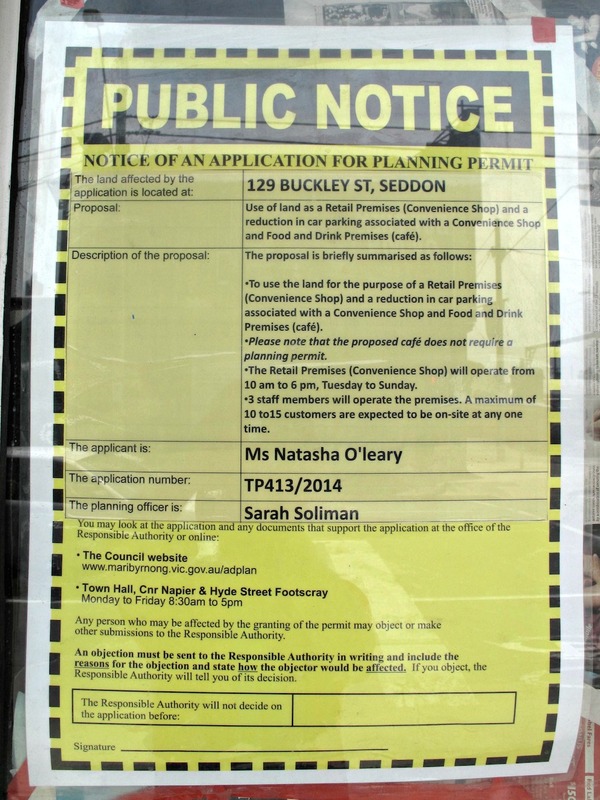 But I have a friend, a decades-long resident of Charles Street, who maintains the Buckley-as-boundary concept is a scam fostered by real estate agents eager to see more properties included in Seddon with a view to higher prices. According to him, Charles Street was – and still is, in his opinion – the boundary between Footscray and Seddon. I’m one of those commuters that drives through most days and rarely visits the area on foot. The former florist/garden/homewares business had a wooden portico up until a couple of months ago. Twice when driving through I had seen people sleeping rough in the doorway and wondered if the portico had been removed so that people would not be protected by the rain there…. and move on…. Hi Shell! I think there’d be very few residents of the inner west that don’t traverse this stretch of Buckley several times a week. I saw signs of rough sleeping in the former display home as well. I’ve been wondering if no one ever really bothers to buy or build along here because it’s been slated since the Victorian Transport Plan (when was that – 2009?) as the route for the inner-west part of East-West Link. 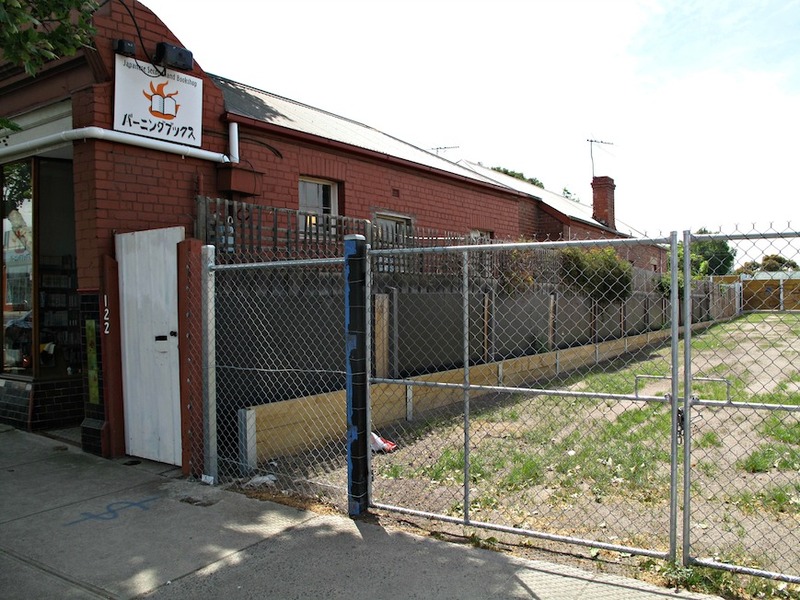 The gym and the martial arts place (between the youth centre and the former florist) seem to be the only new things that have taken root in ages. Hi Jane! I’m not sure. Even if that’s the case, it’d only affect one side of the street, wouldn’t it? I reckon the traffic is the main problem. I’ve heard that the new place on cnr Buckley and Vic is going to be a wholefoods cafe/shop, fingers crossed it’s as good as my sources say! Hi Kim! Wow, that’s interesting. I saw “convenience store” on the applications and switched off! Oh that intersection is sooo dangerous, I agree. You take your life into your hands crossing the road at the lights. I can’t tell you how many times we’ve almost been mown down by right-turning traffic. Is the framer shop still there? The one who moved from Victoria St? Hi Desley! I’ve always thought it was speeding city-bound traffic that was at fault. But, from what you say, maybe the right-turning drivers are also trying to sneak through gaps in the oncoming traffic. And subsequently not being as mindful as they should be of pedestrians! Whatever, yes, bloody dangerous, Thankfully, as we live in Yarraville and eat/work/play elsewhere, mostly we CROSS Buckley using Victoria. I didn’t see a framer on my walk today! Sadly the framer is gone. We used to go to him but about a year ago he decided it was easier working as an employee for someone else than running his own business. Hi Juz! Ain’t that interesting! Have just been talking to a colleague who reckons the same thing is happening with Footscray/West Footscray. The official boundary is Summerhill/Warleigh but he reckons there’s plenty of real estate agents and others who’d rather have us all believe it’s Gordon St! Wow that is so cool! 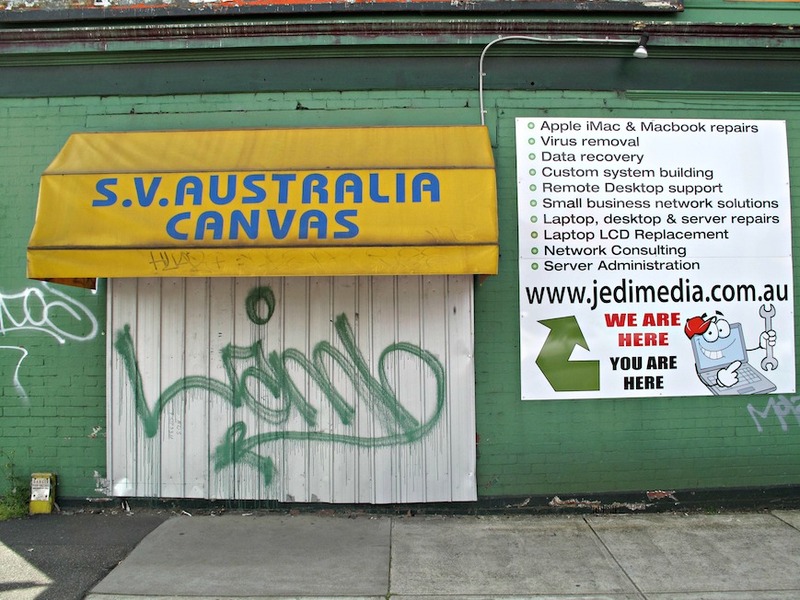 planning a post this week on Footscray South/Seddon based on research by Juz! 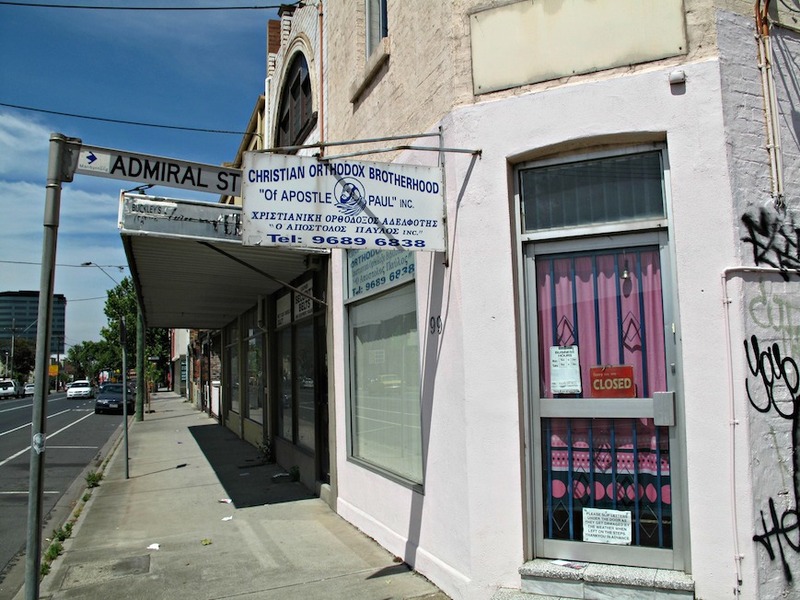 Footscray itself covers the area between Mephan and Owen streets north of Ballarat Road to Somerville Road in the south, bordered by the Maribyrnong river on the east and the West Footscray boundary at the west, with a big chunk taken out for Seddon in the south west. 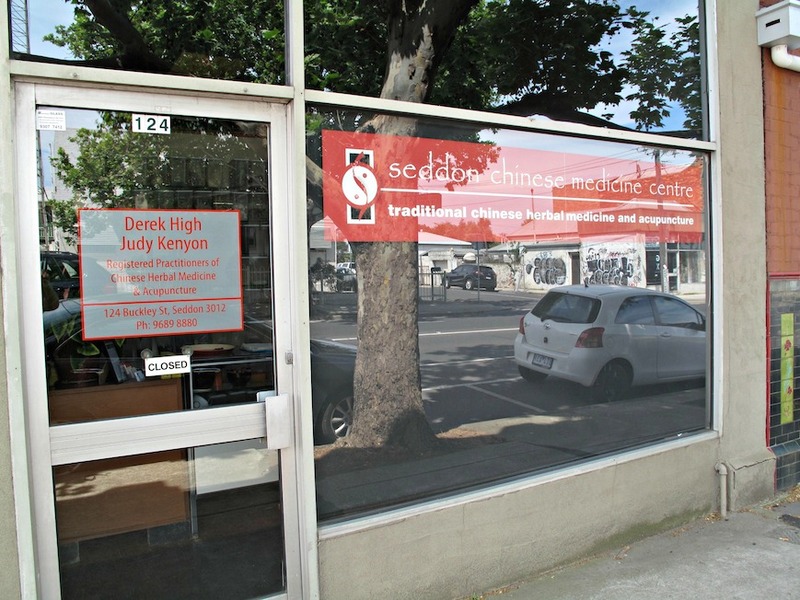 According to Google Maps, Seddon itself is bordered by Buckley Street at the north, Albert, Bristow and Hyde in the east (Which keeps VU’s southern Footscray campus in Footscray) and Williamstown Street in the west. The southern boundary looks like someone couldn’t decide whether the houses on the north sides of Princess, Mackay and O’Farrel streets should be part of Seddon or Yarraville. West Footscray is exactly what I expected (however I made the same “mistake” as the real estate agents) however it includes what I think of as “Tottenham” i.e. the triangle south of Sunshine Road between the Geelong Road and Paramount Road. Indeed, the name Seddon has been used on and off over the years. 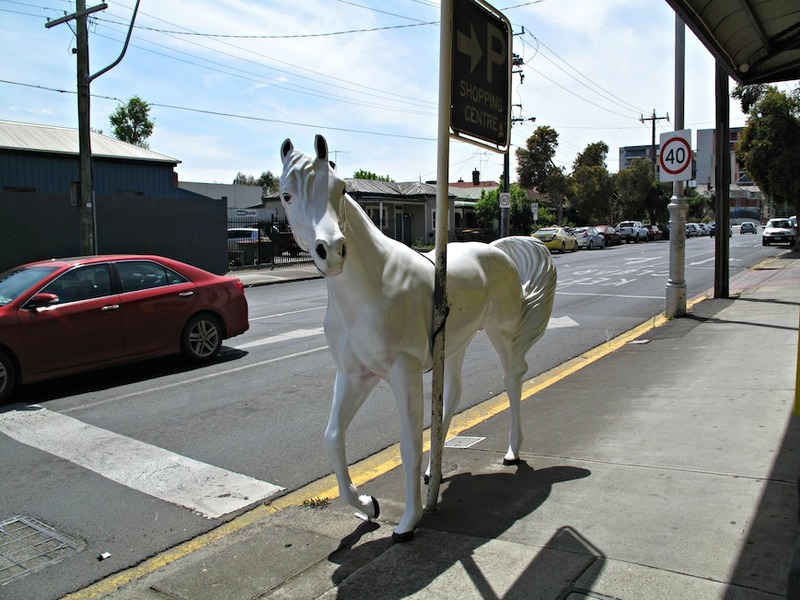 The suburb was created fairly recently, I think (at least in part) from the work of the Seddon Community Group. The boundary of the suburb _is_ Buckley Street, but that was a fairly arbitrary choice; I suppose people might have their own ideas of where the boundary should have been made. If you read through old newspapers, the name seems to be popular at different times. 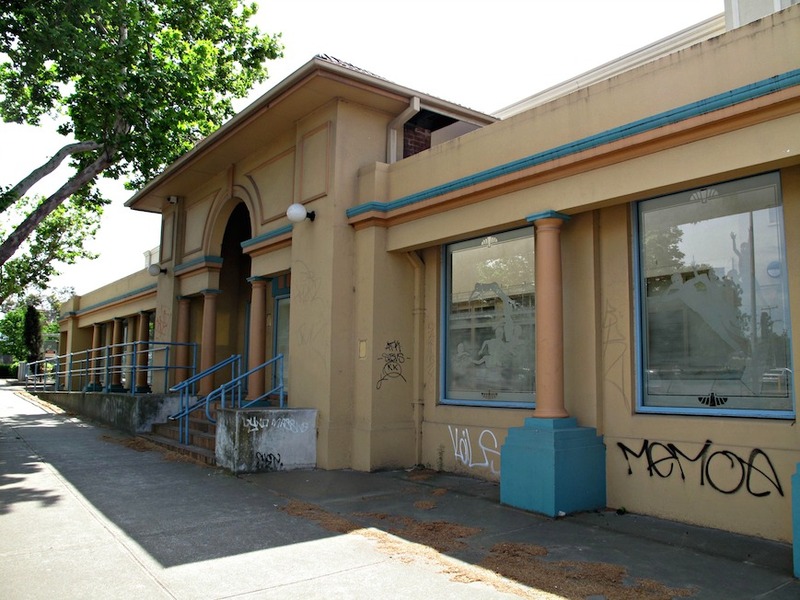 The Seddon train station is an example — it was built by community subscription in the early 20th century, went out of use and was rebuilt in the 1930s. And then obviously again in the 1980s. But it was named after the area, not the other way around. 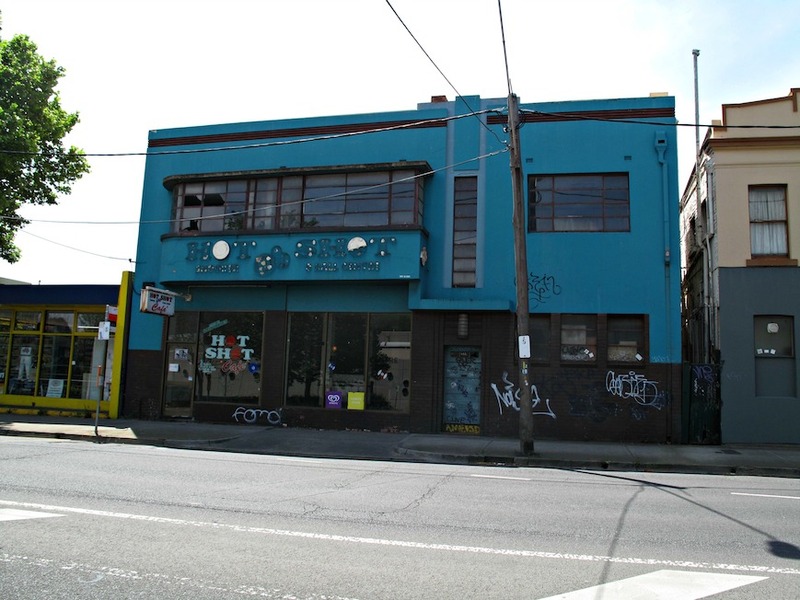 I concur that Buckley S is a right eyesore, and even worse it acts a real divide of sorts between Footscray and Seddon / Yarraville. 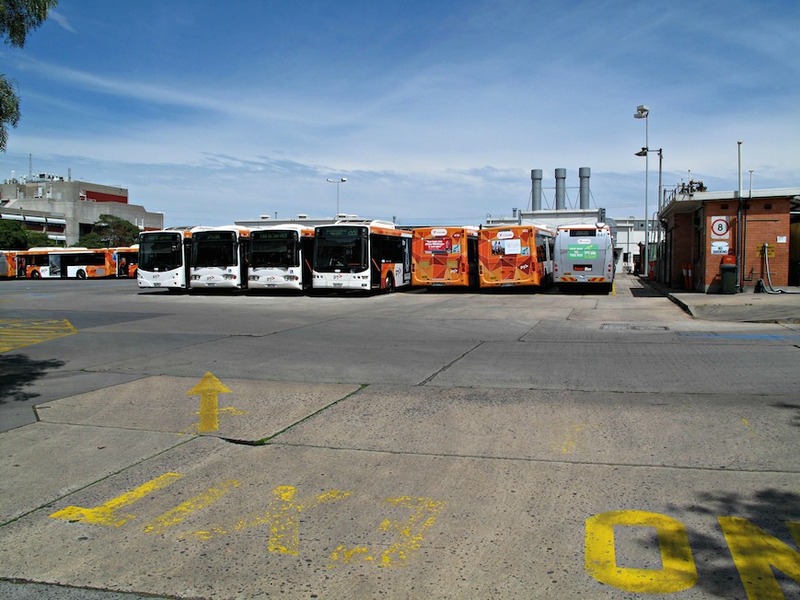 A couple of thoughts – I gather the Bus depot used to be a tram depot, and trams prattled along Buckley st (and elsewhere including Barkly st and Williamstown road – there is some YouTube footage floating around, ,and someone even made a DVD a few years back). 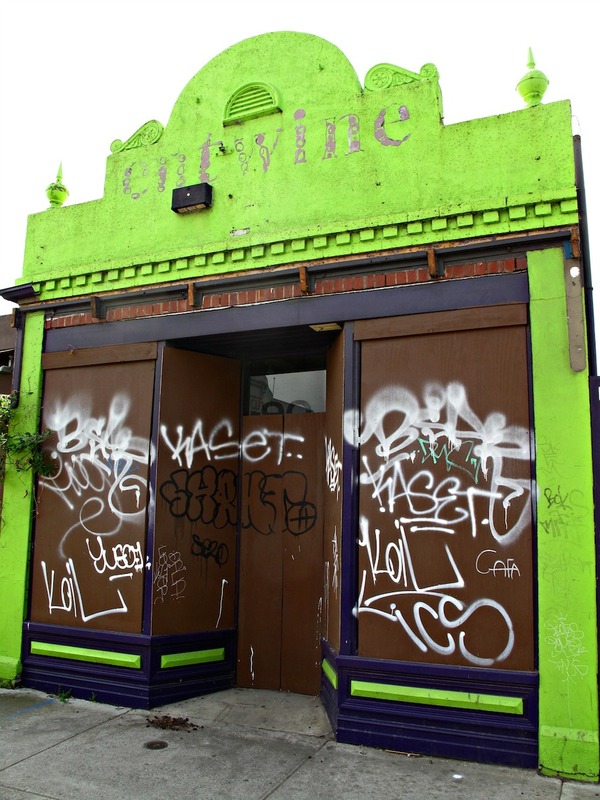 The Council surely must take the lead in catalyzing the urban renewal of the area, but I’m not holding my breath. Finally – and this is a pipe dream – I lived on Bourke St in Sydney when the Eastern Distributor was put in, and it lead to a huge transformation of the entire suburb of Surrey Hills; imagine if the ‘through’ traffic was all put underground, it would really open the way for a sea change! No one’s mentioned Middle Footscray, which I believe was the area north of Charles Street towards, and possibly beyond, Buckley Street. The rail station confirms this. Older residents always said Charles Street was the border between Middle Footscray and Seddon. An interesting snapshot of Buckley Street, Mr Weir. Thanks so much for all the amazing comments and observations. Some time in the coming week or so I’ll do a new post on the fascinating rubbery/fuzzy boundaries, including some good stuff dug up by Juz! Thank you for this post, used to frequent the swimming pool & library regularly in the 70s . I remember the paint shop, west art supplies in the 80s, the bus depot, and the Victoria st end has a brothel & a tyre place, also we used to pick up crates of soft drinks which could also be delivered, lots of childhood memories of this street! Hi Erna! This post is more than two years old now and there’s been changes and there’s more afoot! Still rather bleak, though, IMO! thanks for the post, which I have come to late in the piece. 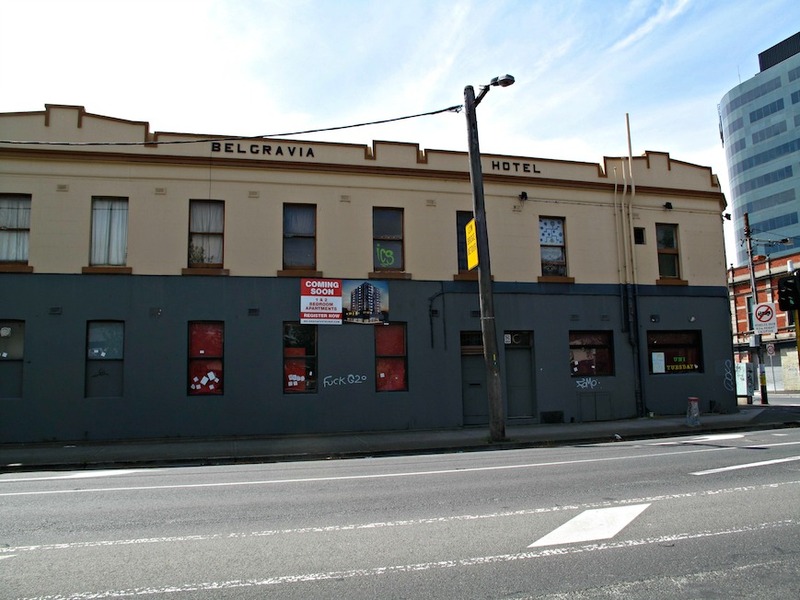 I came across the fact that Belgravia was the original name of the suburb Seddon and was looking for a memory of the Belgravia Hotel, which I had been to years ago, which lead me to your page. I was thinking the hotel must have been named when the suburb Belgravia was on the other side of Buckley Street. 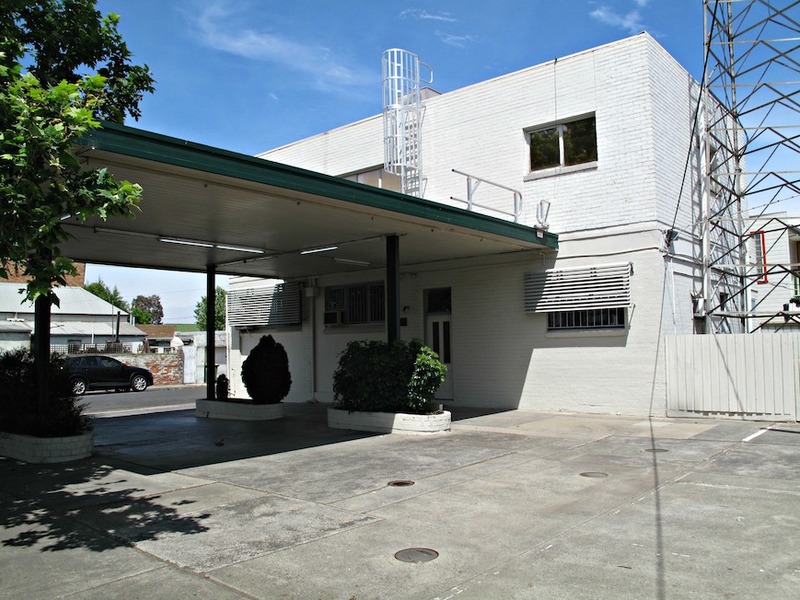 Wong about the “convenience store,” thankfully became Eka whole foods !